A superb extremely compact and versatile battery-powered GSM bug that is ideal for many applications. Perfect as a quick deployment listening device in the house, office, car, van or other vehicle. Simple to use, with excellent performance. The GSM Black Box is a standalone audio bug that can provide the ability to listen ‘live’ to what is happening in the environment where it has been placed without the need to have a permanent mains power supply. 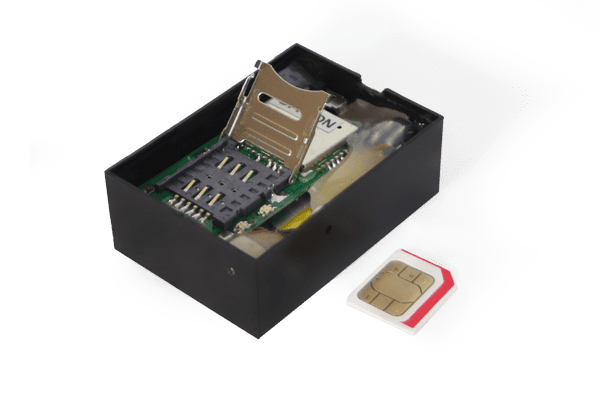 As with all GSM Bugs, the GSM Black Box requires a mobile phone SIM card inserted within so that it can be called from anywhere in the world if required. When the number of the inserted SIM is called the unit will, without alerting attention in any way, auto-answer the call and open up its in-built sensitive microphone that will enable the caller to listen into the surroundings up to 8 metres away. This superb GSM bug unit delivers simply fantastic audio quality. In such a compact enclosure. The limiting factor with most small stand-alone surveillance devices is the battery life. The GSM Black Box has exceptionally compact dimensions, but still manages to function for an impressive period of time. The internal lithium ion rechargeable battery pack will give a combination of up to 8 days standby time and up to 8 hours listening-in time (optimum conditions). This upgraded unit has quad-band capability which means that it can be used in every country worldwide. On top of this, the latest version also features a voice activation facility, with sensitivity setting (sends SMS notification), adjustable microphone sensitivity to suit the environment the unit is placed within. These can be programmed remotely or adjusted using a coded text message. Full instructions are supplied to enable easy use of these extra features. The unit is best deployed in a position where it can pick up sounds in the environment where it has been placed. If placed in a room then a surface above head height would be ideal where it would be less likely to be discovered (possibly on top of a cupboard or curtain pelmet). If hidden inside a vehicle then a good position maybe secured under one of the front seats where the device would still pick up on sounds inside the vehicle, but remain out of sight. The sound activation is best used in a normally quiet environment or just as an alert for an event such as someone entering a room or someone getting into a car. It should be noted that using the voice activation facility will require credit on the inserted SIM (or a contract SIM being used). The unit’s internal lithium battery can be recharged using the supplied USB lead for later stand-alone deployment or it maybe possible in some circumstances to leave the charge lead connected to the GSM Black Box for longer deployment as long as the mains power supply remains on. Should the mains power supply get switched off, then the unit will then revert to taking power for the internal battery, that would then have a full charge. The device has an internal switch so the battery can be charged and the unit remain switched off until deployment. Would the GSM Black Box still pick up sounds if it was on top of a cupboard or underneath a low settee? If the battery expires during use, will the unit make any sounds to indicate that the battery is about to go? The unit is totally covert. The unit will give no visual or audible indication of the battery’s expiration. Will this device work outside the UK? This listening unit has a quad-band modem and therefore will work anywhere around the world on the GSM networks 850, 900, 1800 and 1900MHz bands. Will this unit take any GSM SIM card? 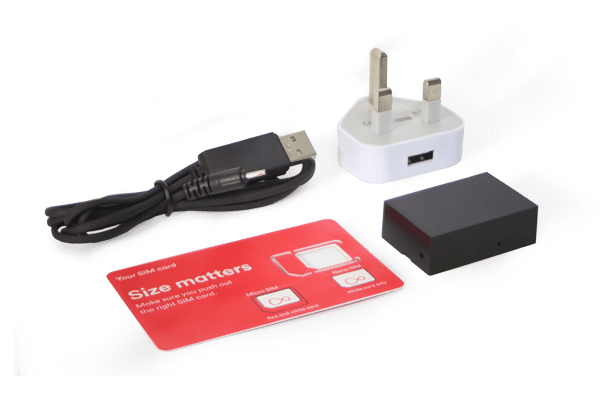 These units have been designed to accept standard size SIM cards from any network, although of course it has been impossible to test every network SIM provider around the world. If I left this on a desk, would it be obvious what it was? Although the device is not immediately a giveaway, a simple examination by somebody with basic common sense would reveal that it was more than a plain black box. It is best to place it in a position out of immediate view. Can I call the unit from any phone (mobile or landline phone)? Yes, the unit will accept calls from both types, but to make use of the voice activation facility only a mobile phone can be used. You will need a working mobile phone to enable you to listen in to the bug and control its features. This unit can take permanent power from the mains and remain switched on ready to use. To be able to take advantage of the voice activation facility and SMS alerts, the SIM card inside the GSM Black Box will require credit or will need to be a contract SIM. The unit can be supplied with a Vodafone SIM with £10.00 credit as a cost option. 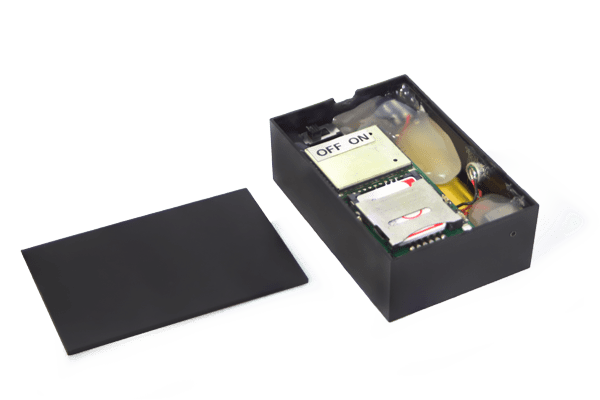 Just like any mobile phone the GSM Black Box can lose network signal from time to time, especially when deployed inside a moving vehicle that is travelling through varying signal strength areas.